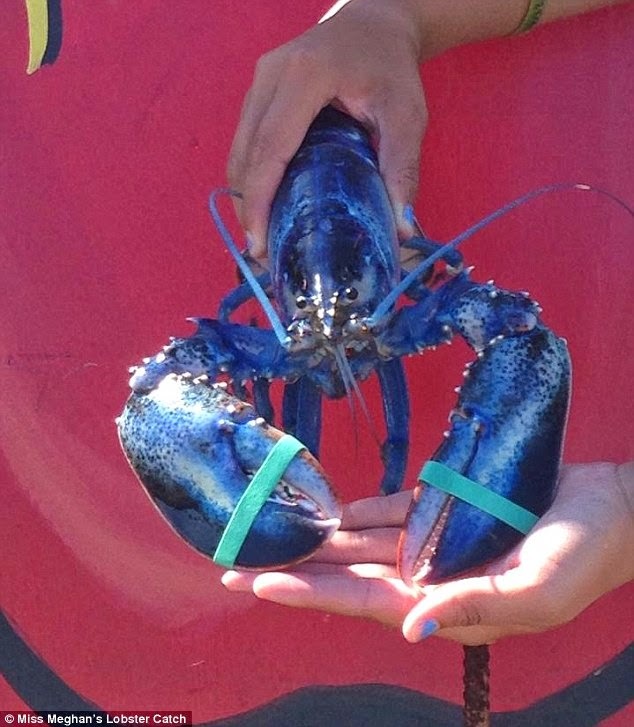 A Maine lobsterman reeled in a one in a million catch when when he trapped an extremely rare blue lobster. Jay LaPlante of the Miss Meghan's Lobster Catch company told reporters he caught the unique crustacean about 10:45 a.m. Saturday roughly 10 miles from Portland. It was his daughter Meghan, 14, who discovered the lobster while hauling in traps. Its estimated that maybe 1 or 2 lobsters in a million are colored blue, according to figures from the University of Maine's Lobster Institute, USA Today reports. The color is the product of a genetic defect causing the lobster to produce too much of a protein. Meghan immediately named the two-pound lobster Skyler, and having bonded with it said it would not be cooked. Instead, she'll make sure Skyler gets a good home at the Maine State Aquarium. There he'll join three of his extraordinarily uncommon blue brothers and a solitary orange lobster. WCSH6 notes the aquarium is open every day of the week from 10 a.m. to 5 p.m. if you're in the area.